The Customize Website menu contains sub-menu items to customize your website. Whenever you need to change anything on your website, this is where you need to go. Remember that any changes you make are instant. If you change something and you do not see it instantly on your website, it means you are changing something else. Your web site profile is the profile that is visible on your web site. Only email is hidden on your web site, the rest will be publicly visible. Update your information (such as your company name, your company slogan, etc). 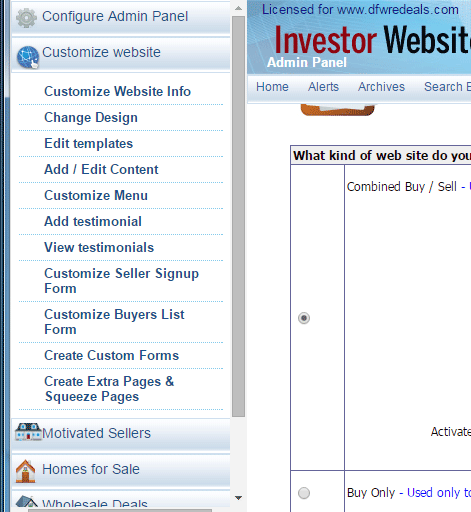 “Your Affiliate Link” – The footer of your web site contains a small logo “Powered By Real Estate Investors Websites“. When you fill your affiliate link here, you will earn 50% commissions whenever any of your visitors buy a web site from us! “Your Google Maps Key” – Wherever you display properties on your web site, the Google map used to require this key. However it is no longer required, so by default leave this field empty.